Can you believe it? It's already Bon Dance Season!!! This year, the first Bon Dance of nine bon dances hosted by the Kauai Buddhist council will launch at Kapaa Jodo Mission on this Friday and Saturday, June 8 & 9 from 7:30 p.m to 10:30 p.m.
Bon Dance is a part of Buddhist Festival known as “O-bon” which honors the spirits of ancestors who are believed to come back to this world during summer time. In order to welcome the spirits, families get together to have a service, pray and dance together with a big feast. 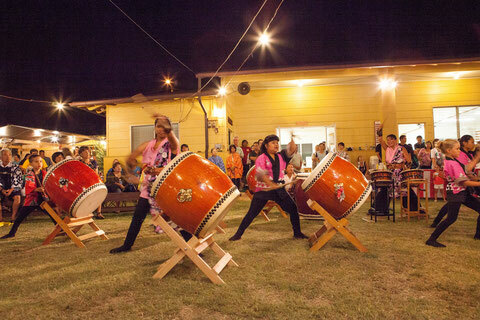 At the first bon dance at Kapaa Jodo Mission, there will be Taiko Drumming Performance by Sensei Aki Conquest and Joyful Noise at the intermission on Friday, June 8 and Okinawan Eisa Dance will be performed on Saturday, June 9. Local food such as Kauai's unique "Flying Saucer" will be available from 6:00 p.m. All are invited and welcome. For more information, please call 635-8530.